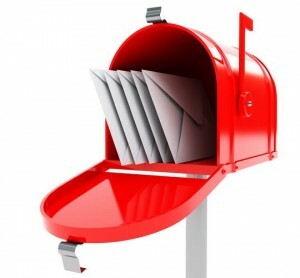 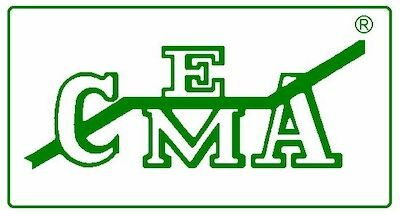 All documents available in English Only. 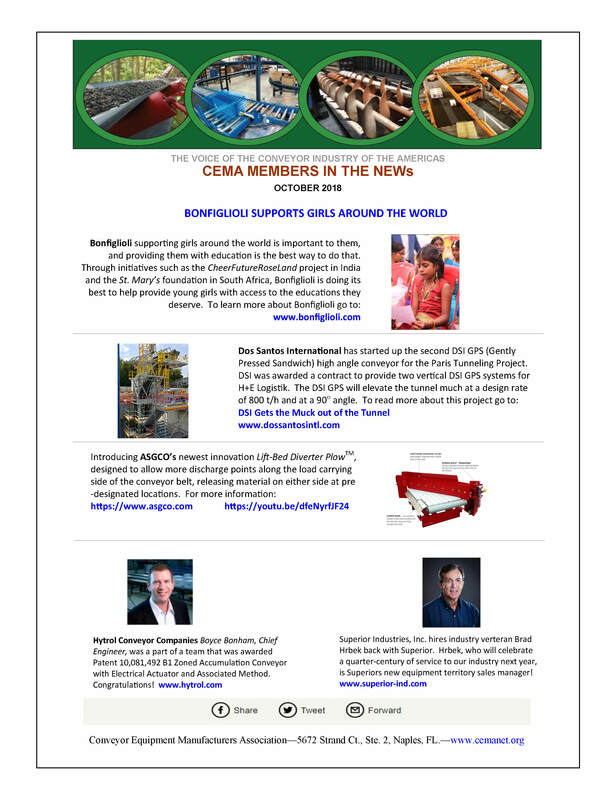 Members In The NEWs – BONFIGLIOLI SUPPORTS GIRLS AROUND THE WORLD, ASGCO’s LIFT-BED DIVERTER PLOW, DOS SANTOS INTERNATIONAL STARTS SECOND DSI GPS ANGLE CONVEYORS FOR PARIS TUNNELING…..… Read More! 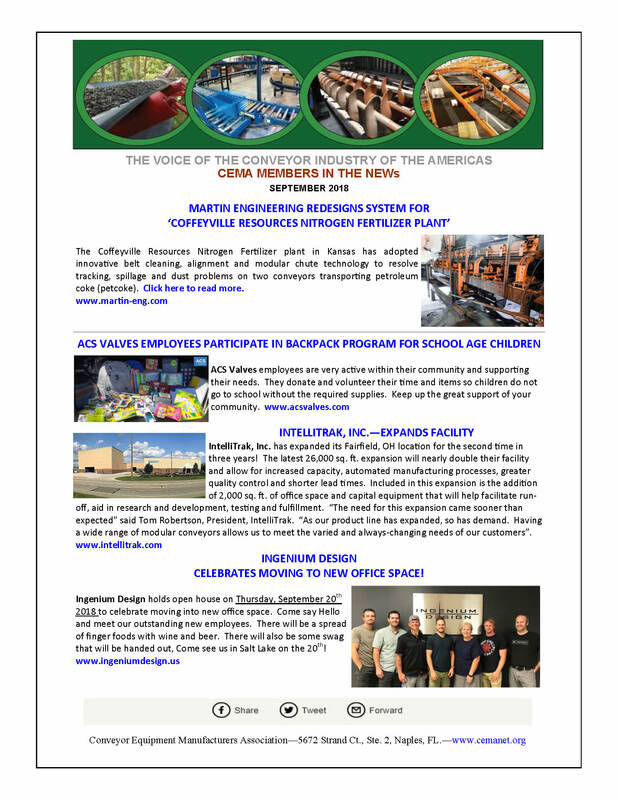 Members In The NEWs – MARTIN ENGINEERING REDESIGNS SYSTEM FOR COFFEYVILLE RESOURCES, ACS VALVES PARTICIPATES IN BACKPACK PROGRAM FOR SCHOOLS, INTELLITRAK EXPANDS FACILITY, AND INGENIUM DESIGN CELEBRATES MOVE TO NEW SPACE WITH OPEN HOUSE!…..… Read More! 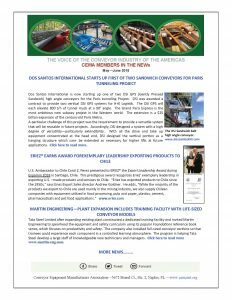 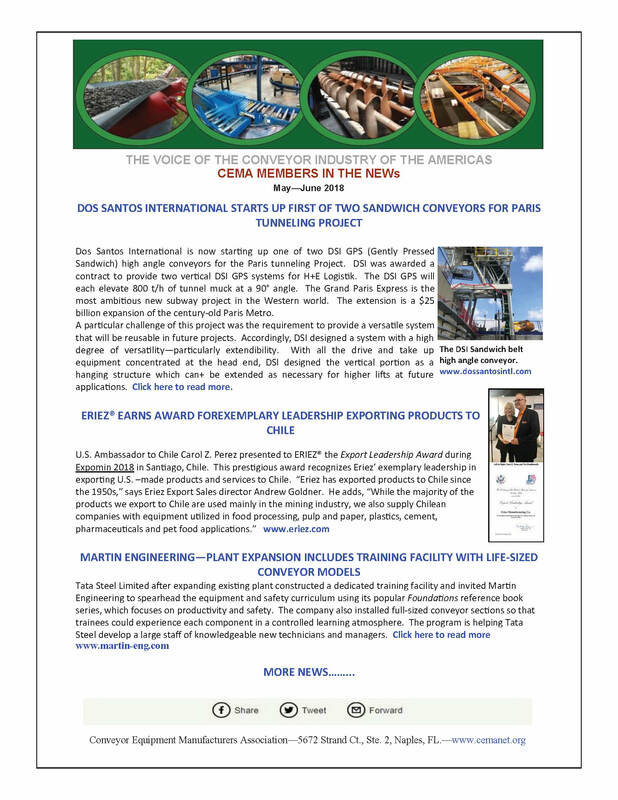 Members In The NEWs – DOS SANTOS INTERNATIONAL STARTS UP FIRST OF TWO SANDWICH CONVEYORS, ERIEZ EARNS EXEMPLARY AWARD, MARTIN ENGINEERING-LIFE-SIZED CONVEYOR MODELS, SUPERIOR NEW CATALOG, SCHNEIDER ELECTRIC EXPANDS ITS ALTIVAR DRIVES FAMILY, KWS MFG GETS MORE POWER AND SPACE!…..… Read More! 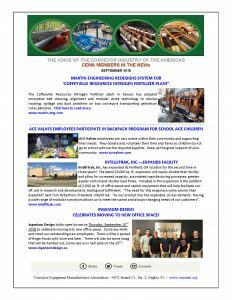 Lenze Americas-NEW MEMBER – AS A GLOBAL MANUFACTURER OF ELECTRICAL AND MECHANICAL DRIVES, MOTION CONTROL AND AUTOMATION TECHNOLOGY, Lenze Americas OFFERS PRODUCTS, DRIVE SOLUTIONS, COMPLETE AUTOMATIONS SYSTEMS, AND ENGINEERING SERVICES AND TOOLS FROM ONE SINGLE SOURCE. 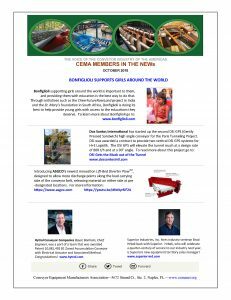 TO LEARN MORE ABOUT Lenze Americas.…..… Read More! 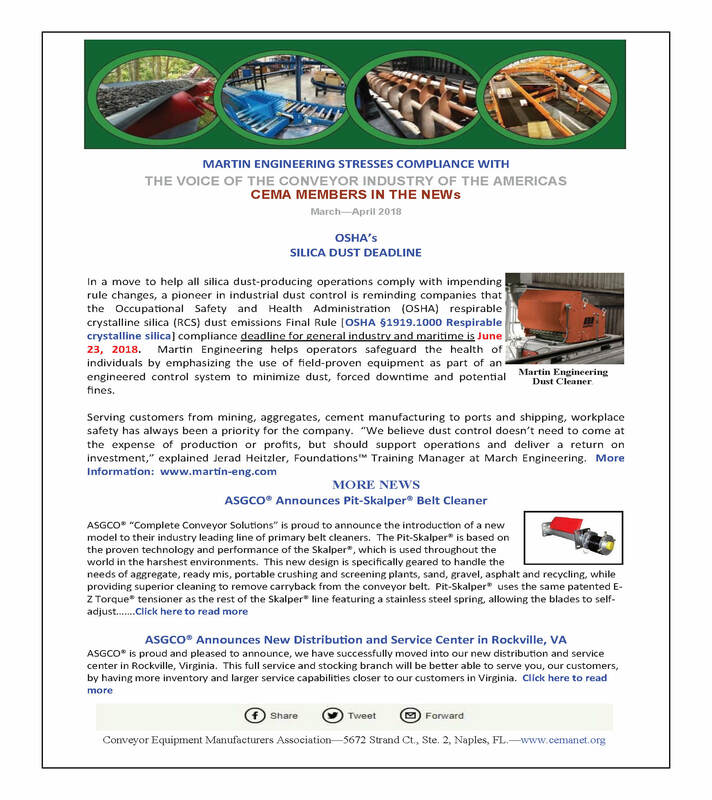 Bedeschi America, Inc.-NEW MEMBER – BEDESCHI CAN PROVIDE ITS CUSTOMERS WITH COMPLETE TURN-KEY SOLUTION FOR DIFFERENT PRODUCT LINES, SUCH AS: …..TO LEARN MORE ABOUT Bedeschi America, Inc..…..… Read More! 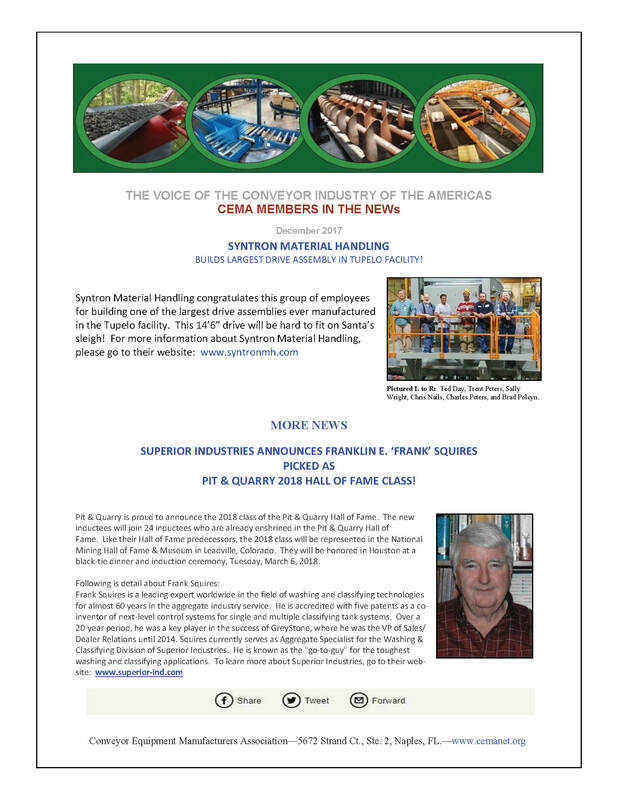 Members In The NEWs – SYNTRON BUILDS LARGEST DRIVE ASSEMBLY, SUPERIOR ANNOUNCES FRANK SQUIRES PICKED AS ‘PIT & QUARRY 2018 HALL OF FAMER’, MARTIN ENGINEERING PARTNERS WITH DISCOVERY CHANNEL HIT TV SHOW ‘GOLD RUSH’, DORNER NEW MULTI-LINGUAL WEBSITE…..… Read More! Bonfiglioli-NEW MEMBER – …..TO LEARN MORE ABOUT Bonfiglioli.…..… Read More! Ashland Conveyor Products NEW MEMBER – …..TO LEARN MORE ABOUT Ashland Conveyor Products.…..… Read More! Groschopp, Inc.-NEW MEMBER – …..TO LEARN MORE ABOUT Groschopp, Inc..…..… Read More! 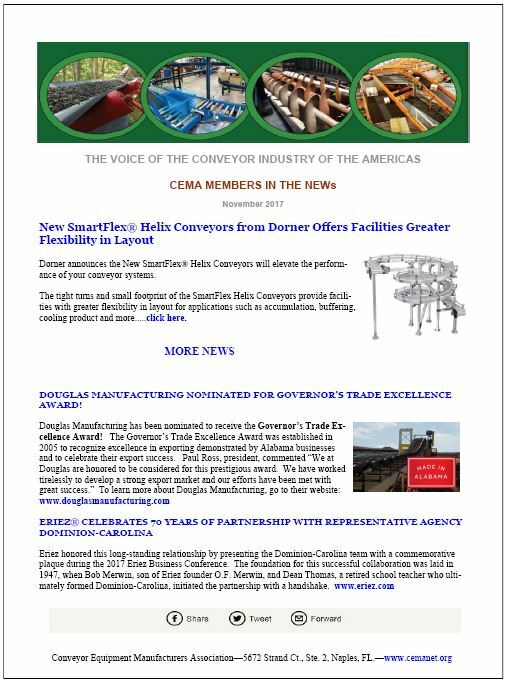 Members In The NEWs – NEW SMARTFLEX HELIX CONVEYORS ARE OUT FROM DORNER, DOUGLAS MANUFACTURING NOMINATED FOR GOVERNOR’S TRADE EXCELLENCE AWARD, ERIEZ CELEBRATES 70 YEARS OF PARTNERSHIP, BUNTING ANNOUNCES NEW GM AND NEW SPIRAL CHUTES…LETTING GRAVITY DO ALL THE WORK!…..… Read More!